A Latham fiber optics supplier has taken its high-tech product a step higher, installing a trio of robots to speed production. Integra Optics said the robots cost more than $1 million to buy and program, and are currently doing the work of five to six people. As such, it will take a while to recoup the investment, but company founder and CEO David Prescott said it is an investment in the future: The market for his product is rapidly expanding, and at maximum capacity, the robots could do the work of 30 people. 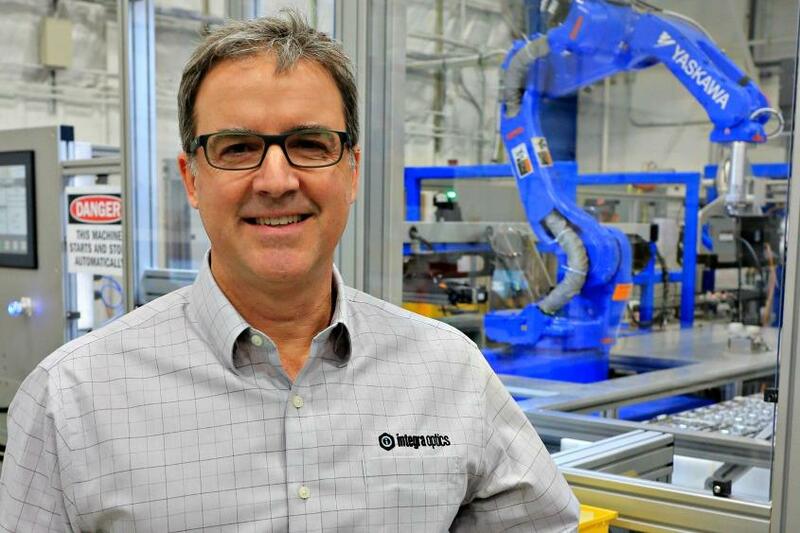 The Integra employees whose functions were taken over by the robots are still working for the company, but in other tasks, said Chief Operating Officer Jeff DeWeese. These include programming and product development, as well as robot care — the machines don’t take vacations or lunch breaks but they do need maintenance. Integra’s headquarters and main manufacturing facility is just outside the perimeter fence at Albany International Airport. It has a new, smaller manufacturing in Sao Paolo, Brazil, and a handful of sales offices sprinkled around the United States. The workforce stands at about 80. Integra’s core product is the fiber optic transceiver, a device that converts outgoing electrical computer data into light and incoming light back into electrical data at either end of a fiber optic line. It is a key part of high-speed data transmission — without it, nothing would go through the cable. A data center or server farm might have hundreds of thousands of transceivers installed. A large hospital might have 1,000. A business like Integra Optics might have 10 to 100. Integra buys the devices from an overseas manufacturer, then codes them for customers’ specific needs and sells them for anywhere from $20 to $20,000 depending on the speed and distance at which they will operate. DeWeese said Integra’s competitors typically will have the manufacturer code of the transceiver installed at an overseas factory and ship it directly to the customer. Integra adds itself as a coding middleman and uses that at a selling point, saying its products are 33 times more reliable. The three Integra robots are known as Rosie, Mac and Lectronimo, names that “Jetsons” fans should recognize as mechanized characters in the 1960s cartoon show. Rosie takes transceivers coming in from the manufacturer and tests them, then fulfills orders by programming and verifying coding and placing the devices in newly designed packaging. Mac organizes storage and retrieval of the transceivers. Lectronimo prepares and packages the finished product. Storage is a key part of another selling point for Integra: It maintains an inventory of products ready to ship, rather than using the just-in-time practices many companies use to hold down costs. Yaskawa designed and built the robots with heavy input from Integra, and Integra did the actual programming of the robots in-house. Around noon Friday, Rosie was working at full speed, grabbing transceivers and whipping them around from station to station. The 8-foot tall glass safety enclosure is there with good reason: Anyone getting too close could lose teeth or break bones if struck by the robotic arm. That’s a marvel of the system, DeWeese said: It can generate enough force to punch through a wall and yet handle sensitive components with the finesse of two (human) fingertips. It’s designed to operate with an 8 micron margin of accuracy but is now running at only 3 microns — 3 millions of a meter. The result is a better process, he said. And more of it. “We wanted to make sure when a customer asked us to provide large amounts of volume, that our answer was 'yes,’” he said.